Sometimes, I like driving to Mr. AMW's office and surprise him! And the best of all? The quick stop at random restaurants within the area before we head home! One of the highly recommended restaurant was a nearby Japanese restaurant called Genya Tonkotsu Ramen. 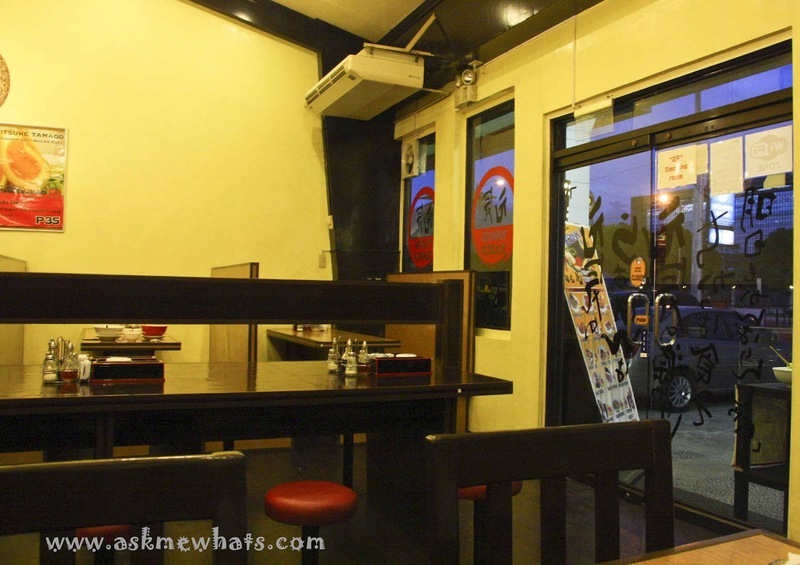 Once we stepped in the restaurant, there was a feeling of familiarity and we immediately felt at home! I took a quick look at their menu and the choices aren't confusing! The restaurant's name says it all! 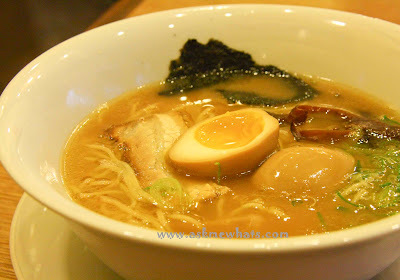 They're Ramen dishes were highly recommended by the servers and of course, you can always try their non-noodle dishes. Check out their menu HERE. The bowl came in huge but the content wasn't overwhelming --- that's the only downside. 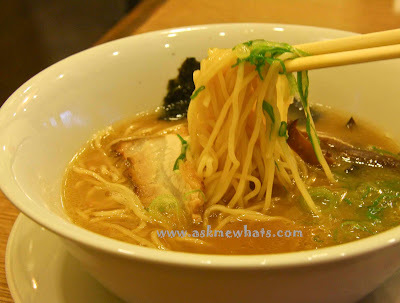 The soup was very tasty and flavorful and the noodles were cooked just right! The Chashu (slices of roasted pork) was very tender and it almost melts into my mouth. 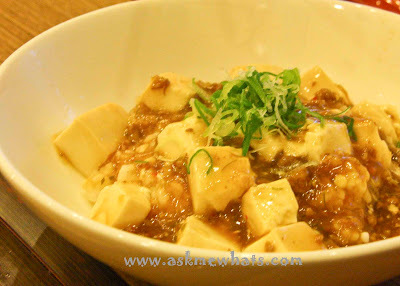 You can also browse their "Additional Toppings" section and the Ajitsuke Tamago caught Mr. AMW's eyes! Ajitsuke Tamago is a seasoned, soft-boiled egg that is limited to 50 servings PER day. It was around 6:00pm when we dined here and so far, we were still within the 50th servings! 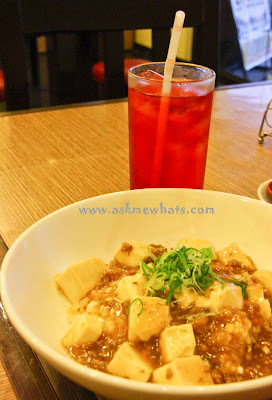 We also tried their Red Iced Tea for Php35.00 (less than $1.00). The restaurant may seem boring and quiet but looks can be deceiving! They have Bikkuri Ramen Challenge! 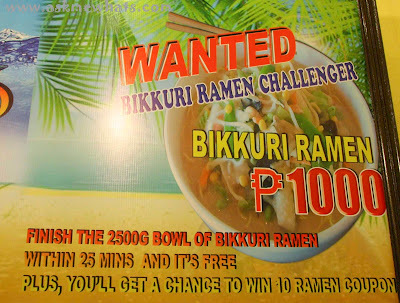 What's a Bikkuri Ramen Challenge? A challenger must finish a 2,500g bowl of Bikkuri Ramen (seafood ingredients) in 25 minutes and this Php1,000 (approx $23.25) Ramen will be yours for free! Aside from that, you get to have your photo taken and posted on the wall! I've seen the huge bowl and I've seen how much ingredients they put inside this bowl! I won't dare try this! Will you? The restaurant only accepts cash payment so please make sure to have cash on hand when you decide to dine in here! The restaurant also has a space for solo diners located at the center! Hobbies of Asia, Macapagal Blvd. What's your favorite Ramen Place? Any other recommendations for Mr. & Mrs. AMW? oh no! I disliked food that's loaded with MSG! I get the throat pain the very next day!